Katie Micik reported yesterday at DTN (link requires subscription) that, “Farmers are ready to put 2014 in the books and move on, according to the latest results of the DTN/The Progressive Farmer Agriculture Confidence Index. The DTN article noted that, “Livestock producers are more confident than their row-crop brethren, the Ag Confidence Index shows. At 106.4, the latest reading is down from last August on a more pessimistic view of what the year ahead holds. Prices for livestock are down from their record highs, hog and broiler production are expanding, and concerns about comparatively high retail beef prices have helped rein in hopes. Meanwhile, Richard Silk and Lucy Craymer reported in today’s Wall Street Journal that, “Australian and New Zealand farmers are having a tough time selling lambskins as China’s tanneries face slowing demand for the products, particularly from Russia, and as Beijing cracks down on some chemical-intensive processing plants. Jacob Bunge and Kelsey Gee reported in today’s Wall Street Journal (“Farmers Deploy New DNA Test for Tastier Meat“) that, “When Mark Gardiner looks at one of his bulls, he sees generations of high-quality steaks. 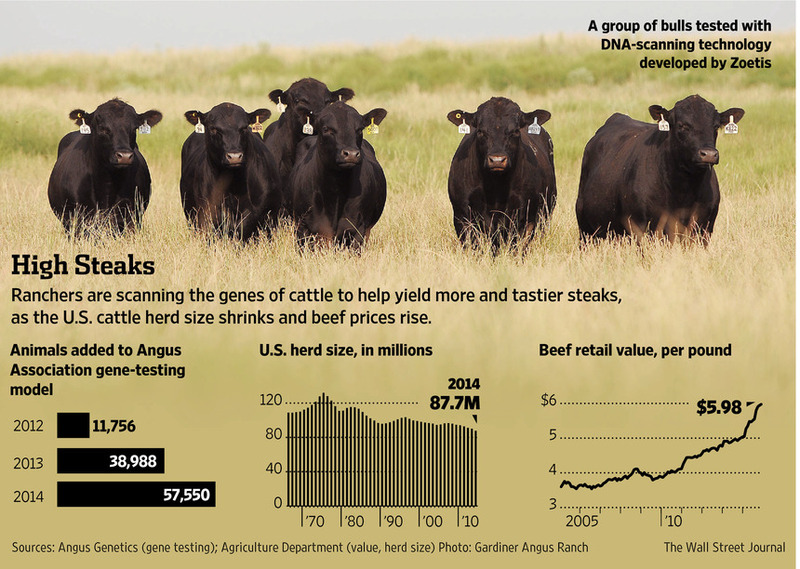 “By having his animals’ DNA scanned by a gene-testing firm, Mr. Gardiner, a Kansas cattle breeder, can tell nearly from birth how many pounds they are likely to pack on per day and how much rich, marbled beef their carcasses will yield. The Journal writers explained that, “Soaring cattle prices are helping fuel investment in beef genetics. The nation’s cattle herd has dwindled to its smallest size in 60 years after years of drought in the southern Great Plains parched pastures and drove up feed costs. Tight supplies of steers and heifers have meant record prices for young beef cattle in the U.S., and retail beef prices were projected to climb 11% to 12% in 2014, according to U.S. Department of Agriculture estimates [related graph]. “While that advice hasn’t always worked out in the short run, companies like Monsanto Co. are poised to benefit from it in the long run. The world’s growing population combined with a scarcity of new arable land has been driving demand for crops with resistance to disease and pesticides. Jeevan Vasagar reported yesterday at The Financial Times Online that, “A small grilled sausage from Bavaria has become the unlikely symbol of German resistance to the transatlantic trade deal being negotiated between the EU and the US, after the country’s agriculture minister warned that ‘not every sausage can be protected’ in the trade talks. The FT article pointed out that, “While GM food and investor protection rules remain the most contentious aspects of the Transatlantic Trade and Investment Partnership (TTIP), the agriculture minister’s remarks provoked an outcry in support of the Nürnberger Rostbratwurst, a finger-sized pork sausage from Nuremberg which is protected as a regional speciality by the EU. Yesterday’s article added that, “The sausage in question has been subject to strict local regulation since the 14th century; in the Middle Ages, Nürnberger Rostbratwurst failing to meet the city authorities’ quality standards were dumped into the Pegnitz river, which runs through the Bavarian city of Nuremberg. The Reuters article noted that, “‘We have made clear to our American counterparts that the protection of geographical indications is one of our main priorities,’ EU trade spokesman Daniel Rosario said. Meanwhile, Vicki Needham reported yesterday at The Hill Online that, “President Obama and Mexican President Enrique Peña Nieto agreed Tuesday to work together on U.S. plans to reestablish diplomatic and economic ties with Cuba after a lapse of more than 50 years. And Thomas F. “Mack” McLarty, White House chief of staff and special envoy for the Americas under President Bill Clinton, indicated in a column in today’s Wall Street Journal that, “Early in the year, Congress is expected to take up legislation that would grant the administration trade-promotion authority. This authority allows the president to send a trade agreement to Congress for a straight up-or-down vote without the ability to add crippling amendments that could kill the deal. U.S. negotiators are hoping to conclude two major trade agreements–the Trans-Pacific Partnership and the Transatlantic Trade and Investment Partnership–that would be submitted for a vote. Mr. McLarty added that, “When trade-promotion authority came up in Congress last year, Senate Democrats blocked it. Doing so again would be bad policy and bad politics. Now the minority in both houses, congressional Democrats can draw a sharp contrast with the Republicans’ hyperpartisan, defeat-at-any-cost tactics. Instead Democrats can be a constructive force for elevating the discussion and giving President Obama an important bipartisan accomplishment. And on the issue of currency values, The Wall Street Journal editorial board opined in today’s paper that, “The most important economic story these days is the relentless rise of the dollar, with effects good and ill. We’d be more confident of the benefits if the world’s central bankers appeared to be navigating this monetary weather with any kind of rudder. The Journal pointed out that, “All other things being equal, we prefer a strong and stable dollar to a falling one. But note the word stable. Currency volatility has costs, as Nobel laureate Robert Mundell teaches, and movements as far and fast as the dollar’s could create some economic wreckage. “A stronger dollar would help the world more if it were also stable,” the Journal editorial said. Emiko Terazono reported this week at The Financial Times Online that, “Sugar fell to a three-month low, battered by a stronger dollar and worries about plentiful supplies from Mexico and the Black Sea region, despite expectations of drier weather in Brazil which could lead to output declines. The FT article explained that, “Despite concerns about drier than normal weather in Brazil, the largest producer of the sweetener, with the amount of rain in November and December lower than 2013, producer selling continued due to the lower Brazilian real against the dollar. Also with respect to sugar related issues, Reuters writer Laura Zuckerman reported earlier this week that, “Corn syrup was found to be more toxic to female mice than table sugar, shortening their lives and cutting their rate of reproduction, according to a study by University of Utah researchers published online in a scientific journal on Monday. Seung Min Kim reported yesterday at Politico that, “A Republican House member from Alabama is set to propose legislation to override President Barack Obama’s sweeping moves on immigration, even as GOP leaders ponder their response to the executive action. Jacob Bunge reported earlier this week at the Money Beat blog (Wall Street Journal) that, “Crude oil’s latest skid Monday dealt another dent to ethanol producers’ shares, as investors gauged the potential for slimmer profits on each gallon of the corn-based fuel additive. The update noted that, “Green Plains Inc., which runs plants capable of producing about 1 billion gallons of ethanol per year, settled 10.2% lower Monday. Archer Daniels Midland Co., which maintains the largest U.S. ethanol production capacity, settled 3.5% lower, and Pacific Ethanol Inc.- which last week added to its bet on ethanol by acquiring a rival – fell 7.7%. Coral Davenport reported in today’s New York Times that, “The White House on Tuesday made it clear that President Obama would veto a bill authorizing construction of the Keystone XL oil pipeline, setting up an immediate clash with Republicans just as they assume control of Congress. In budget developments, Jonathan Weisman reported in today’s New York Times that, “After the drama of electing a new speaker of the House and the changing of control in the Senate, the House on Tuesday approved an obscure but significant rule change requiring the economic effects of legislation to be included in a bill’s official cost to the Treasury. Bernie Becker reported yesterday at The Hill Online that, “The White House ripped House Republicans on Tuesday for implementing new budget rules that look more favorably on tax cuts. Also, Siobhan Hughes reported earlier this week at The Wall Street Journal Online that, “The new lawmakers taking their seats in Washington on Tuesday represent not just a changing of the guard in Congress but a change in the pedigree of its members. They have spent less time marching through the traditional steps toward elected office, instead forging political identities their own way.